Fox Sports 1 continues to play around with things as they head towards the second half of their first year on the air. Fox Soccer Daily has been pulled from the schedule, likely through the Super Bowl. Now, the network is making a slight adjustment to its flagship show, one that will likely help the duo Fox is ostensibly betting on to bring viewers to the network. 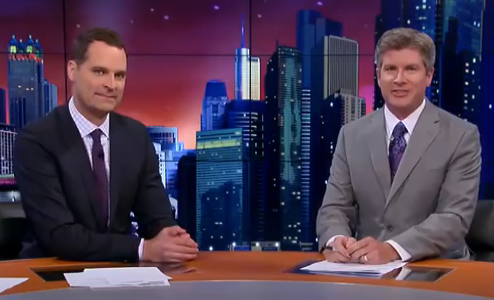 Richard Deitsch of Sports Illustrated reported that, starting Tuesday, Fox will move the Fox Sports Live anchor duo of Jay Onrait and Dan O'Toole to Tuesday-Saturday each week. Previously, the pair had been working Sunday-Thursday. No other changes have been announced to the program, so it's likely the Tuesday-Friday versions will remain with a panel, while the Saturday version will be the two of them working alone. Why the change? No explanation was given, but the fact is, the Friday and Saturday editions of FS Live, for the most part, have been the highest-rated versions of the show. Let's look through the month of December alone at viewership totals for the initial hour (11 p.m. – Midnight ET, or whatever the first edition of that night is) of the show. Unless noted, Sunday-Thursday is hosted by Onrait & O'Toole, while Friday and Saturday are hosted by a various rotation of substitutes. *- The Christmas Eve show was a countdown of top highlights of the year hosted by Onrait and O'Toole, while substitute anchors hosted on Wednesday. As you can see, Fox can expose Onrait & O'Toole to nearly double the viewers watching most their shows with just this simple adjustment. It'll also let Fox promote Jay & Dan during FS1's (and Fox's) Saturday baseball package when baseball kicks in a couple of months from now. It's clearly a good move when you look at the numbers. Sunday and Monday nights (along with the occasional Thursday with no football) have been a black hole for Fox just because ESPN and NBC have the attention of most sports fans with the NFL. The way to best let the best version of their flagship show (and Onrait & O'Toole by themselves on Sundays are easily the best thing Fox Sports 1 has to offer) is to expose them to as many people as possible. The Friday and Saturday night episodes of Fox Sports Live have been higher rated than Sunday-Thursday simply because of the live sports lead-in for the program. It should be noted that, when reached for contact, Onrait told Awful Announcing that he and O'Toole will be working the show on at least one more important Sunday: following Fox's broadcast of the Super Bowl. In the long run, however, Fridays and Saturdays are probably the best bet for Jay and Dan to begin gaining some traction, just by sheer luck of the lead-in.